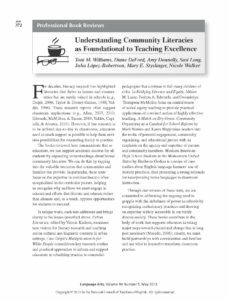 Summary: This article from the NCTE journal Language Arts reviews several professional books that explore issues of equity and access. The books reviewed share the view that, as educators, we can support academic success for all students by expanding understandings about home and community literacies. It would be useful as a resource for study groups and teachers searching for books for their professional libraries, while others will find useful information on community literacies in the reviews themselves. The books reviewed here communicate that as educators, we can support academic success for all students by expanding understandings about home/ community literacies. We can do this by tapping into the valuable resources that communities and families can provide. In particular, these texts focus on the expertise in communities too often marginalized in the curricular picture, helping us recognize why and how we must engage in educational efforts that liberate and educate rather than alienate and, as a result, oppress opportunities for students to succeed. Williams, Toni M., Diane DeFord, Amy Donnelly, Susi Long, Julia López-Robertson, Mary E. Styslinger, and Nicole Walker. “Understanding Community Literacies as Foundational to Teaching Excellence.” Language Arts 90:5 (2013) 372-379. Copyright ©2013 by the National Council of Teachers of English. Reprinted with permission.